Are you a federal employee interested in making the District a better place for everyone to live, work and play? Consider supporting Casey Trees work through the Combined Federal Campaign (CFC), the only authorized workplace charitable giving drive for employees of the federal government. Casey Trees CFC Code is 24598. Giving through the CFC is easy to do. You determine the amount to give - minimum $1 per pay period - and the method of payment. New in 2009, you have the option to give electronically by filling out and printing an online Pledge Form or you can contribute via credit/debit card and e-Check electronic bank transactions in a paperless e-Giving process. You can also continue to donate by filling out the traditional paper Pledge Form. Payroll deduction is still a great choice if you choose the paper or online Pledge Form. 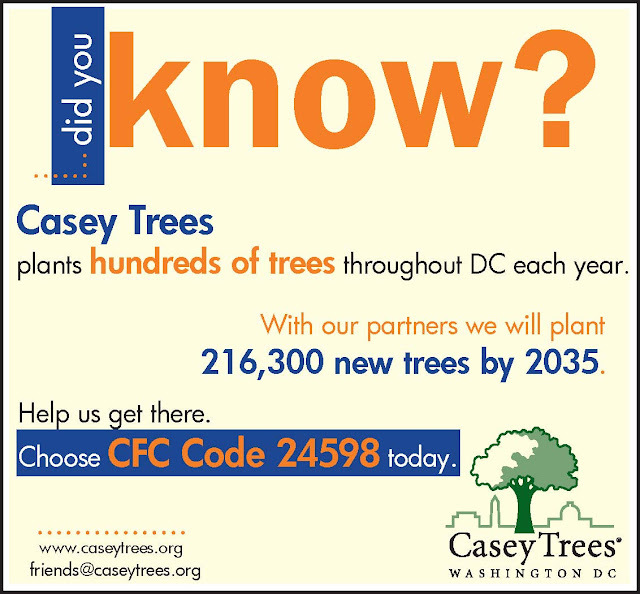 If you are not a federal employee, you can still help Casey Trees’ work through financial gifts. Donations of any amount can be securely made online. Several Casey Trees tree planting and education initiatives are available for sponsorship.